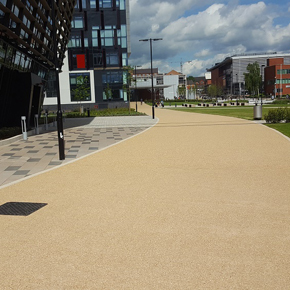 This project saw Aggregate Industries, also based in the county, supply concrete to create an aesthetically arresting array of public paths and seating in the main section of the university. The remodel, taking place at Mill Lane, was undergone by Aecom Landscaping. 400 cubic metres of Artevia colour concrete and golden gravel aggregate were used to develop a visual and structural layer design. Artevia proved ideal to enhance the ‘streetscape’ design pallet and offered a sufficient level of durability required for a concrete that is inevitably going to encounter heavy foot traffic. In designing the slabs for the project at every stage of the process, from concept to installation, Aggregate and Aecom worked alongside each other. The two went through the specification of bespoke concrete mixes, logistical planning to secure the best quality materials to enhance the visuals and onsite technical assistance throughout the installation. Artevia is the ideal choice of material for projects such as these, as it becomes possible to conjure varying visually stunning design textures and colours, that are able contrast with other materials or surroundings. Low maintenance and naturally slip/skid resistant; it is perfect for busy walkways. Specification manager at Aggregate Industries, Neil Cochrane, commented: “Mill Lane at DMU was a fantastic project to work on. The requirements allowed us to showcase the versatility or our product range, especially our Artevia colour concrete, which can help create beautiful landscapes even within busy areas. Project landscape architect at Aecom, Tom Jonson, expressed his joy at the finished product: “We are delighted with the end result which is not only visually appealing but incredibly durable, being able to withstand the high frequency, high volume associated with a University Campus. The laying of the Artevia exposed concrete was completed by Mollington Contracts Limited.